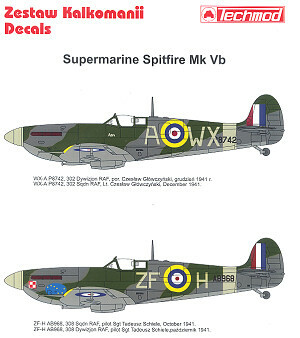 If you have the Trumpeter 1/24 Spitfire and want a different scheme from what comes in the kit, you should consider this new sheet from Techmod. 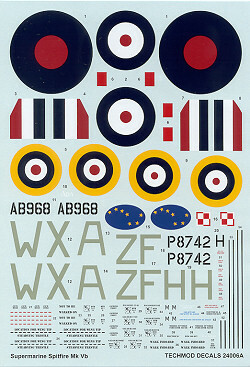 The sheet contains markings for two aircraft, both in standard RAF camouflage from 1941, the then-new continental scheme of green and grey with yellow wing ID markings and sky spinners and fuselage bands. This early scheme keeps the large roundels and fin flashes, making for an interesting scheme. First aircraft is from 302 Squadron and piloted by Lt. Czeslaw Glowczynski in late 1941. It includes his personal marking under the windscreen. The other is from 308 Sq and piloted by Sgt. Tadeusz Schiele in Ocober of 1941. This one has a large 'big dipper' marking on the nose along with the Polish insignia. The sheet is superbly done and appears to be quite thin. A full set of data markings are included for one plane. The instructions are first-rate with full color painting guides and a comprehensive data markings sheet. If your hobby shop doesn't stock Techmod sheets, ask for them to order them for you. If you would like your product reviewed fairly and quickly by a site that has well over 300,000 visitors a month, please contact me or see other details in the Note to Contributors.